Citron is believed to be the first cultivated citrus fruit. 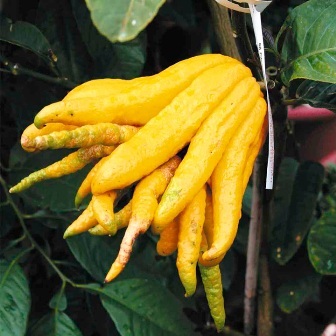 Records in literature indicate that citron was planted in gardens of the Mediterranean region as early as in 4000 BC. There no unanimity of opinion about the origin of this fruit. 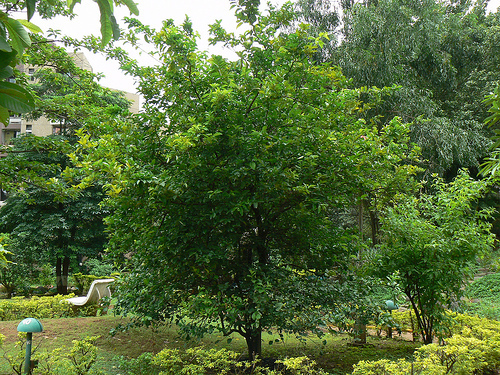 Citron is a shrub or small tree reaching 8 to 15 ft (2.4-4.5 m) high with stiff branches and stiff twigs and short or long spines in the leaf axils. The leaflets are evergreen, lemon-scented, ovate-lanceolate or ovate elliptic, 2 1/2 to 7 in (6.25-18 cm) long; leathery, with short, wingless or nearly wingless petioles; the flower buds are large and white or purplish; the fragrant flowers about 1 1/2 in (4 cm) wide, in short clusters, are mostly perfect but some male because of pistil abortion; 4- to 5-petalled, often pinkish or purplish on the outside, with 30 to 60 stamens. Peel is yellow when fully ripe; usually rough and bumpy but sometimes smooth; mostly very thick, fleshy, tightly clinging; pulp pale-yellow or greenish divided into as many as 14 or 15 segments, firm, not very juicy, acid or sweet; contains numerous monoembryonic seeds, ovoid, smooth, white within. The peel is candied and used in a variety of desserts. The pulp can be eaten, but is often too acidic for many people. The fruit plays role in the Jewish Feast of the Tabernacles. 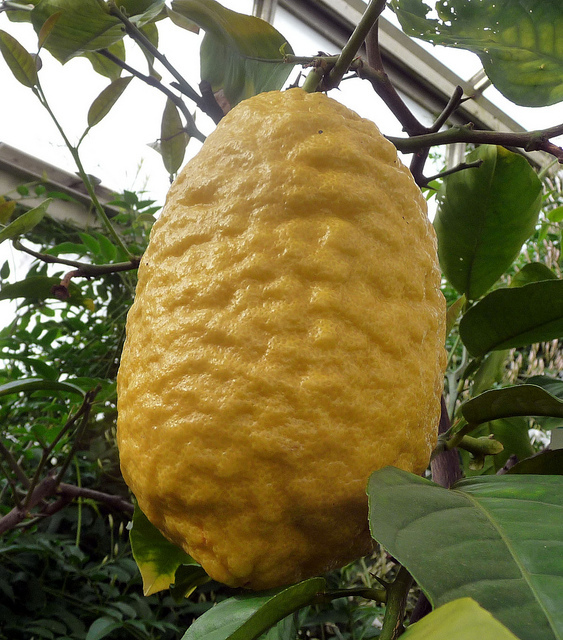 Citron is not a very climate specific fruit and can grow both in subtropical and tropical environments. For getting marketable fruits of attractive quality, irrigation will be needed in summer as well as winter months. Citron trees do not like standing water. The ordinary type can further be categorized into two types. One has sour pulp. This type is called a “Bajoori” in North West India. The other type has acidless pulp. This is known called “Amritphal” in North West India. In Mediterranean region, the acidic varieties include the Florentine and Diamante Citron from Italy, the Green Citron, the Balady Citron from Palestine. The sweet varieties of this area include the Corsican and Moroccan Citrons.